The flagship Nissan Maxima continues to set the bar for premium sedans, combining breakthrough sports sedan styling, a driver-oriented cockpit, ample comfort and luxury for passengers and an advanced drivetrain anchored by Nissan’s legendary VQ-series V6 engine. For the 2013 Nissan Maxima, enhancements include a new SV Value Package featuring a 9-speaker Bose® audio system, SiriusXM Satellite Radio (SiriusXM subscription required, sold separately), heated front seats, heated steering wheel, heated outside mirrors and a new Bose® Audio Package. The Sport Package has been revised to add Monitor Package content (7-inch color monitor, USB connectivity, iPod® net in center console, RearView Monitor), plus climate-controlled driver’s seat and Dark Hyper Silver-finished 19-inch aluminum-alloy wheels. One new exterior color, Pearl White, is also added. Maxima is offered in two well-equipped models – Maxima 3.5 S and Maxima 3.5 SV, each featuring a standard 290-horsepower 3.5-liter DOHC 24-valve VQ-series V6 engine and Xtronic CVT® with manual and “Ds” (drive sport) modes and available paddle shifters. 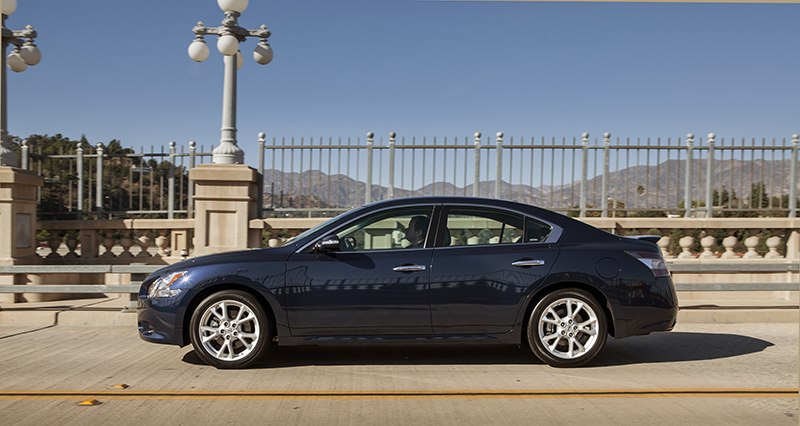 On the road or standing still, Maxima offers a dynamic presence that distinguishes it from other mid-size sedans. Maxima’s exterior is highlighted by the flow of its powerful and beautiful surfaces, like the undulation of a wave. 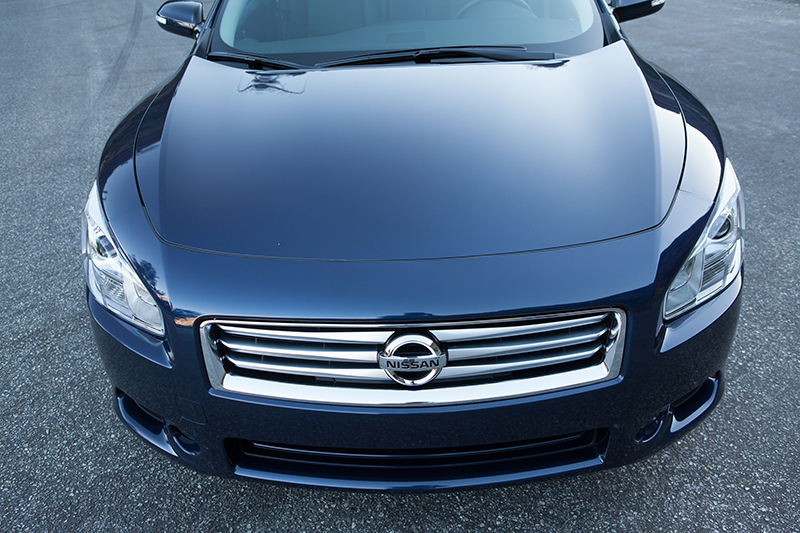 The look starts with Maxima’s aggressive stance and powerful fender volume. This deeply sculpted body/fender treatment is seldom used for mass market vehicles because of the engineering and manufacturing complexity required to physically accomplish it. Maxima’s aggressive performance stance is created by its sporty proportions that carefully balance wheelbase and overall length and accented by 18-inch and available 19-inch aluminum-alloy wheels and low-profile performance tires. Maxima’s exterior also imparts a strong premium presence. The large, wraparound L-shaped headlights add a unique dimension to the overall design, while the light surrounds suggest a powerful “turbine” appearance of energy and strength. The upturned headlight shape combines with a signature Nissan grille design, large bumper opening and bulging “catamaran-style” hood to give Maxima a formidable expression, setting the tone for the rest of the vehicle. Smoke-colored High Intensity Discharge (HID) Xenon headlights and a dark chrome grille finish are available with the optional Sport Package. The powerful Maxima form continues along its profile, with careful layering of the bumper, hood and fender parting lines. The polished, elegant motion spreads from the deep-waisted rear fenders through distinctive Maxima-style C-pillars and high trunk lid. 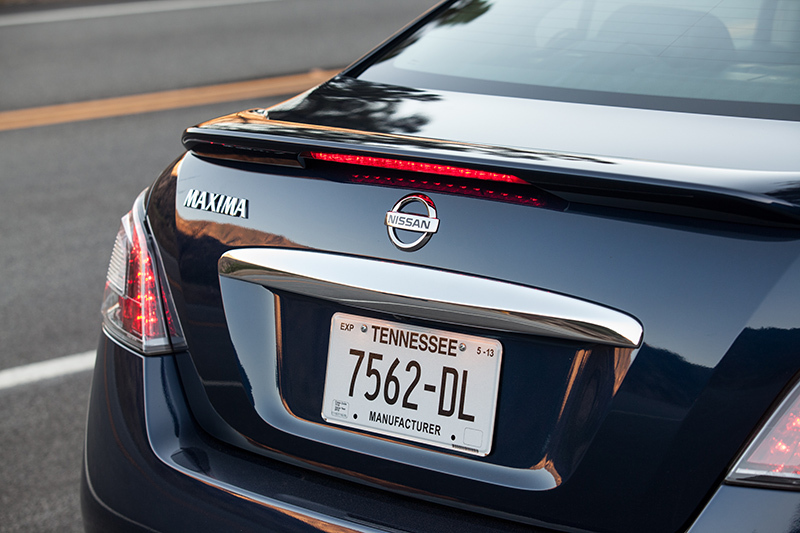 At the rear, Maxima features a 12-LED L-shaped taillight design, with a pair of side marker bulbs for added visibility during night driving. Another unique styling feature is the available Dual Panel Moonroof, which combines a front section that moves like a normal moonroof (positioned farther forward than typical) and a fixed translucent rear section that provides light to rear seat passengers. The overall design gives the appearance that the entire roof is composed of black glass. The Dual Panel Moonroof includes dual power sunshades for both the front and rear glass sections, adding a level of convenience. It is offered as part of the Premium Package. Maxima is available in a choice of eight exterior colors: Java Metallic, Crimson Black, Metallic Slate, Brilliant Silver, Super Black, Tuscan Sun, Navy Blue and new Pearl White. Maxima’s interior design provides the feeling of a sports car with controls ergonomically close, yet with ample roominess and comfort for both driver and passengers. The instrument panel features “Daytime Illumination” electroluminescent meters with white illumination color. The tachometer is rotated so the engine redline is placed at the 12 o’clock position, and there is extensive use of chrome surrounds for the gauges, vent rings, vent knobs and audio switches. 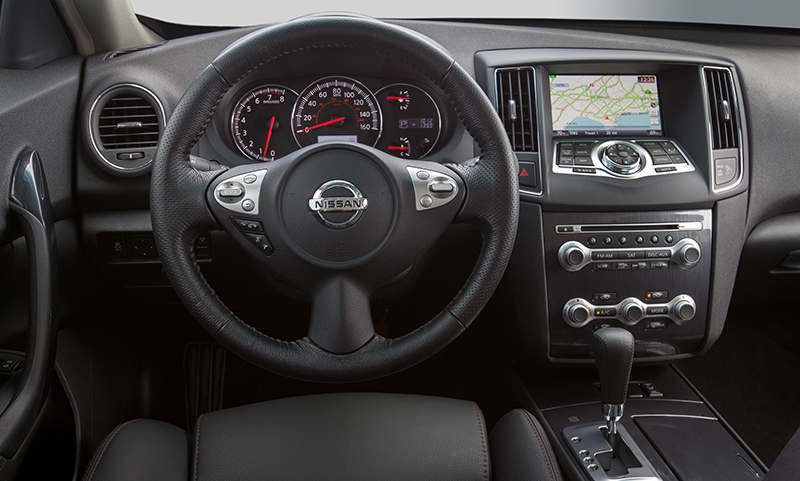 The sport-oriented three-spoke steering wheel features a unique “parallel” pattern steering wheel stitching (versus the traditional baseball-style stitching) for enhanced grip on Maxima Sport and Premium Packages. A unique shiny gray stitch color is included with the Sport Package. The driver’s seat includes an available manual thigh extension for long distance driving and additional padding in the side bolsters for good lateral support during sporty driving. The seat is also available with heating and cooling functions and premium leather-appointed surfaces with special stitching. Also available are power lower lumbar and memory functions. Two different rear seat layouts are offered – a 60/40 fold-down rear seat with access to the trunk, and a fixed rear seat with center armrest pass-through for carrying long items such as skis or other sporting equipment (Sport Package and Premium Package). There is a choice of two interior colors – Café Latté and Charcoal. Comfort and convenience features include a standard moonroof, 8-way power driver’s seat and 4-way power adjustable front passenger seat, dual-zone automatic temperature control, cruise control with illuminated steering wheel mounted controls, Nissan Intelligent Key® with Push Button Ignition, power windows and door locks, AM/FM/CD6/MP3 audio system with eight speakers, Bluetooth® Hands-Free Phone System and available USB connectivity. In creating driving performance worthy of Nissan’s flagship, the Maxima body and chassis engineering teams worked together to create a secure feeling, virtually no torque steer during acceleration and a level of nimbleness that ultimately makes a car fun to drive. Utilizing Nissan’s advanced “D platform” as its foundation, Maxima features a standard 3.5-liter VQ-series V6 engine rated at 290 horsepower and 261 lb-ft of torque. The engine includes a modular engine design with microfinished crank journals and cam lobes, molybdenum coated lightweight pistons, a resin intake collector, digital knock control, six individual coils (one per spark plug) and a cross-flow coolant pattern. Also utilized are a Continuously Variable Valve Timing Control System (CVTCS), a variable induction system, a silent timing chain and electronically controlled throttle. Maxima also utilizes a six-point engine mounting system, which includes upper and lower torque rods, high rigidity front and rear aluminum brackets and front and rear switchable control mounts to improve NVH performance under high engine torque conditions. All 2013 Maximas come equipped with a refined Xtronic CVT® with manual mode, tuned specifically for Maxima’s sporty driving character. For drivers seeking more aggressive shift operation, “Ds mode” (drive sport) electronic control logic programming provides increased acceleration feel with higher engine revolutions, automatic engine braking and maintaining engine speed during cornering. Available steering column-mounted paddle shifters allow for manual transmission-like shift changes while the driver’s hands remain on the wheel. Maxima’s suspension is designed to be both stimulating and relaxing, combining responsive handling with a comfortable ride. The subframe-mounted strut/coil spring front suspension makes extensive use of lightweight aluminum parts. An X-type upper cowl structure helps provide front body rigidity for suspension mounting. Maxima’s multi-link independent rear suspension design, also subframe-mounted, offers outstanding handling by minimizing camber change during cornering. The rear shock absorbers and springs are separated and the shocks are in line with the center of the rear wheels, providing excellent damping and minimal harshness. Front and rear stabilizer bars are standard. Braking is provided by standard 4-wheel vented disc brakes with a 4-channel, 4-sensor, 4-wheel Anti-lock Braking System (ABS) with Electronic Brake force Distribution (EBD) and Brake Assist. Maxima also features a Twin Orifice Power Steering (TOPS) vehicle-speed-sensitive power rack-and-pinion steering system with the quickest steering ratio of any Nissan sedan (15.2:1) to help provide its sporty steering feel. A strut tower brace contributes to Maxima’s steering precision and rigidity. Maxima offers standard 18-inch aluminum-alloy wheels and 245/45R18 all-season tires. The Maxima 3.5 SV model with Sport Package features 19-inch Light Hyper Silver-finish aluminum-alloy wheels with 245/40R19 all-season or summer performance tires. Maxima comes equipped with standard Nissan Advanced Air Bag System (AABS) with dual-stage front supplemental air bags, seat belt sensors and an occupant classification sensor, front seat-mounted side-impact supplemental air bags and roof-mounted curtain side-impact supplemental air bags for front and rear outboard occupant head protection. Also standard, along with front-seat Active Head Restraints, are 3-point rear seat belts for all seating positions, front seat belts with pretensioners, load limiters and adjustable upper anchors, emergency inside trunk release, Zone Body construction with front and rear crumple zones, LATCH (Lower Anchors and Tethers for CHildren) and Tire Pressure Monitoring System (TPMS). Maxima also features standard Vehicle Dynamic Control (VDC) with Traction Control System (TCS). Maxima has also received the ALG Residual Value Awards for Best Fullsize Car for four years in a row (2009, 2010, 2011 and 2012). The ALG Residual Value Awards recognize the vehicle in each industry segment that is predicted to retain the highest percentage of original price after a conventional three-year period. 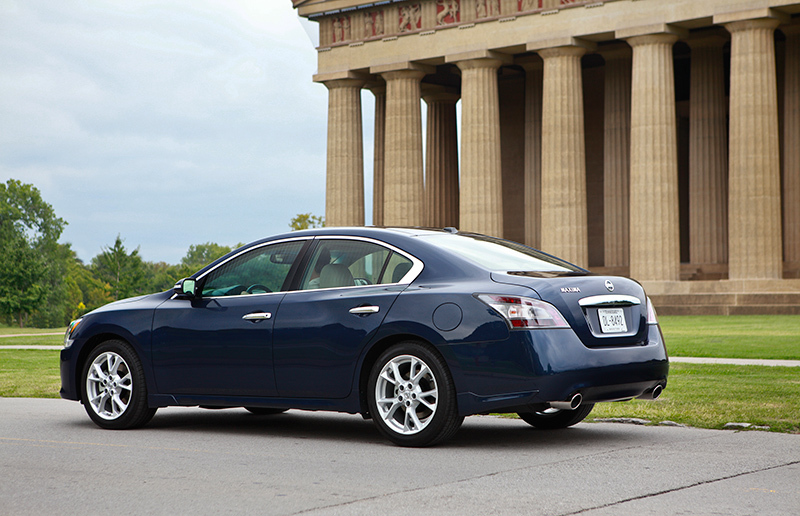 The 2013 Maxima is offered in two well-equipped models. In addition to the long list of standard features found on every Maxima 3.5 S model, Maxima 3.5 SV adds leather-appointed sport seats, HomeLink® Universal Transceiver, fog lights and outside mirrors with turn signal indicators. A number of packages are also offered. The new SV Value Package features a 9-speaker Bose® audio system, SiriusXM Satellite Radio (SiriusXM subscription required, sold separately), heated front seats, heated steering wheel and heated outside mirrors. The Sport Package’s equipment includes a sport-tuned suspension, 19-inch aluminum-alloy wheels, rear spoiler, High Intensity Discharge (HID) Xenon headlights, heated outside mirrors with reverse tilt-down feature, automatic entry/exit system with power tilt/telescoping steering wheel and two-driver memory, heated front seats and steering wheel, paddle shifters, metallic finish trim, premium leather-appointed seats, smoked headlight covers and dark chrome grille. For 2013, the Sport Package has been enhanced to also include a 7-inch color monitor, USB connectivity, iPod® net in center console, RearView Monitor, climate-controlled driver’s seat and more. The Premium Package includes the Dual Panel Moonroof with rear roof window and front and rear power retractable sunshades, High Intensity Discharge (HID) Xenon headlights, heated outside mirrors with reverse tilt-down feature, automatic entry/exit system with power tilt/telescoping steering wheel and two-driver memory, heated front seats and steering wheel, paddle shifters, premium leather-appointed seats, Atlantic Cherry wood-tone trim, 7.0-inch color monitor, RearView Monitor and more. Tech Packages are available for Maxima SV, SV Sport and SV Premium and include an advanced Nissan Hard Drive Navigation System with Voice Recognition, NavTraffic with Real-Time Traffic Information, NavWeather (SiriusXM subscription required, sold separately), Streaming Audio via Bluetooth®, 7.0-inch touch screen color monitor and DVD playback capability. Other available packages include the new Bose® Audio Package, the Monitor Package, High Intensity Discharge (HID) Xenon Headlights, Cold Package and 19-inch Summer Tires.